Nan khatai is an egg-less light and crispy biscuit that's perfect to serve with tea or coffee. 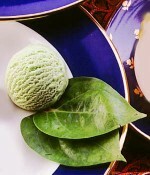 Rich icecream tastes like paan. Peach cake is made with a basic cake batter and fresh or frozen peaches.